Is there a way to restrict or allow how much of the schedule employees can view? It's possible to restrict the view of the schedule based on your preferences. To change this, go to Dashboard > Settings > Company Settings. 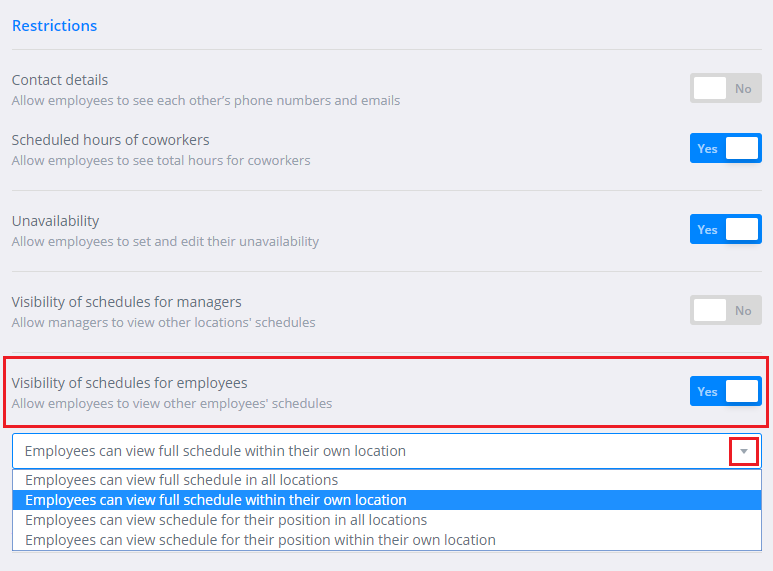 Scroll down to the Restrictions section and you will see an option for Visibility of schedules for employees. Use the toggle to choose your preference. Selecting No means employees can only view their own schedule. Selecting Yes will show additional options in a drop-down menu. Click Save at the bottom of the page and the change will take effect immediately.